Have YOU stayed at the Westin Maui Resort and Spa in Kaanapali Maui? Click here to share your story! 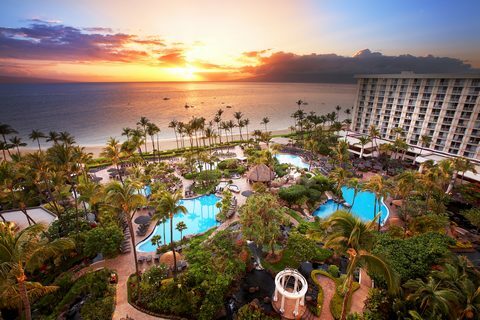 The Maui Westin Resort and Spa is another beautiful 4-star property in gorgeous Kaanapali Maui, and fronts one of the best beaches on the island! There's a lot to like about the Maui Westin Resort and Spa, but I must admit that the thing that excites me the most is the amazing pool area that has got to be one of the best on the island! I'm totally a kid at heart, and the Westin Maui Resort and Spa aquatic playground looks like it would be SO much fun to explore! For a change in scenery, Kaanapali Maui beach is right out front and perfect for a stroll or a swim. Also, fantastic snorkeling here is just a short walk down the beach to the famous Black Rock, Maui! which features not one... not two... but FIVE fire knife dancers! As you would expect from a 4-star resort in Kaanapali Maui, the Westin Maui Resort and Spa has their very own award-winning, ocean view spa to pamper you! 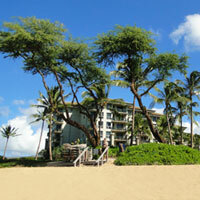 According to Travel and Leisure's Best Spas 2009, they are one of the top 5 hotel spas in the state of Hawaii. I'm thinking that their outdoor massages in a cabana sound nice! They also offer manicures, pedicures, steam rooms, saunas, whirlpools, couples rooms, hydrotherapy, a Vichy shower, hair services and more. If you need a boost to your tan (or you're like me, insanely fair skinned, and need to get one started asap!) they can take care of that too! Feeling mellow after your afternoon at the Maui Westin's spa? Why not finish off a perfect day with a nice dinner, and then drinks at the resort's moonlight lounge? The Westin Maui Resort and Spa has a nice variety of dining options: Ono Bar and Grill, Tropica Restaurant and Bar and the Colonnade Cafe. The award-winning Tropica, pictured above, boasts the great ocean views that one expects at Kaanapali Maui, along with tiki torches, tumbling waterfalls and live entertainment nightly! They serve breakfast daily, and dinner on Wednesdays to Sundays only. 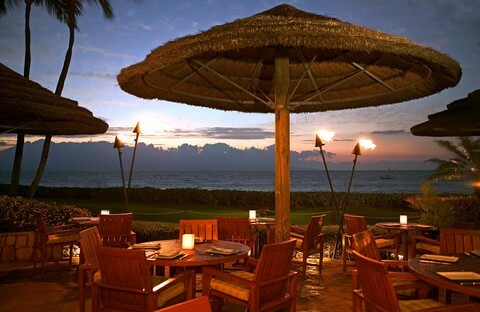 Tropica is one of the more expensive restaurants at the Maui Westin Resort and Spa. Ono Bar and Grill is open daily for breakfast (quick and casual all the way to a decadent buffet! ), lunch and Tapas Hawaiian style dinner. The prices are in line with most casual dining restaurants. At the Collonade Cafe, guests can pick up a quick and inexpensive continental type of breakfast. The Collonade Cafe also serves up casual lunches daily. If you want a daytime snack when lounging around at the Westin's pool or beach, the centrally located sea Dogs is a great spot! They sell fare such as hot dogs, pop, shave ice, ice cream and more. I'm always happy to see a convenient spot to grab a bite to eat during those pool and beach days! It's great not to have to get all dried off to dine indoors! The Westin Maui Resort and Spa offers a choice of non-smoking mountain or Ocean view guest rooms, with all of the usual amenities. If you'd like to bring your fur baby along on vacation, you'll be glad to know that the Maui Westin is a pet-friendly hotel. They even have a "Heavenly Dog Bed" especially for your beloved pet (plus, a leash and food/water bowls!) If you DO plan on bringing your pet with you, be sure to familiarize yourself with the State of Hawaii's animal quarantine laws! If you really want to indulge, there are also spacious luxury suites available. These 1-bedroom suites boast over 1200 square feet of living area, separate dining areas, parlors, wet bars, marble-tiled bathrooms. sunken spa tubs with Jacuzzis, and full ocean views from their balconies. There is also the Maui Westin Kids Club, for ages 5-12, which puts on various daytime and evening activities. When dining at the resort restaurants, ask about their latest deals such as kids eat free or 50% off for older kids. Avis is set up right next to the concierge desk. This is especially helpful if you're arriving later in the day via Kapalua airport. The car rental places that offer shuttle service to that particular airport close at 5 p.m. (unlike Kahului airport where you have until 11 p.m. to pick up your rental car.) How nice to have the option of taking care of your rental car right at the resort! You can workout at the Maui Westin's nicely equipped fitness center, overlooking their gorgeous swimming pools. They offer complimentary shuttle service to Maui's Starwood Hotel Properties, as well as to the town of Lahaina. Search for the best rates! Or, use the search box on your left to search for the best rates from over 30 providers at once! I didn't have any photos of my own to share with all of you here, so I was very happy when the Westin Maui Resort and Spa graciously allowed me to use their own photographs for this article! Thank-you Westin Maui! 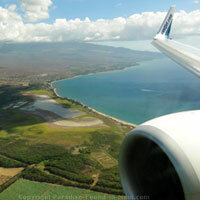 Find out more about things to do and places to stay in Kaanapali Maui! 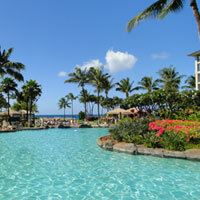 So What Did YOU Think About the Westin Maui Resort and Spa? Have you ever stayed at this hotel? What were your favourite things about it? Was there anything you did NOT like? Share your thoughts here! *File size for pictures should be a maximum of 100 KB. Maximum width for pictures is 450 pixels.